Half-Life 2: Raising the Bar (An excellent book written by Valve, showcasing the art and design work that went into Half-Life and Half-Life 2. In addition to the book itself, it is signed by Erik Wolpaw and Jay Pinkerton. ) collected in My Video Game Art Books by Alex Engel - Collected It! I had this book for years, and I've read through it many times. It's helped me be a better game designer, and helped me think critically about decisions I make for our studio. When PAX East 2011 came around, Valve had a Portal 2 booth on the show floor. I took the opportunity to ask Erik Wolpaw and Jay Pinkerton to sign the book; though it is not a Portal art book, it embodies the same design philosophy underlying Portal and Portal 2. 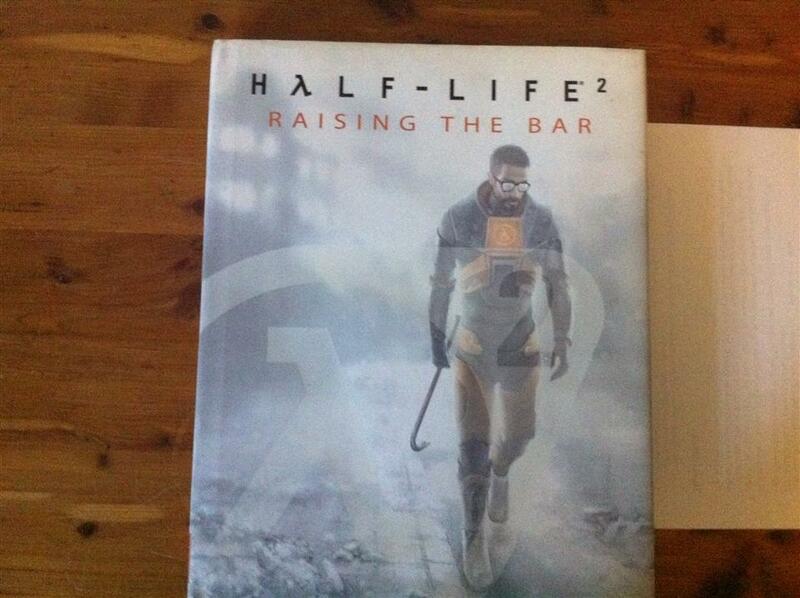 An excellent book written by Valve, showcasing the art and design work that went into Half-Life and Half-Life 2. In addition to the book itself, it is signed by Erik Wolpaw and Jay Pinkerton.